I have enjoyed journaling since I first learned to write. I have many journals filled with thoughts, prayers and ideas. My journals vary from spiral bound notebooks to leather bound. I have written with pencil, pen, felt tip, and calligraphy pens. One of my favorite books on journaling is Write It on Your Heart by Carolyn Sutton. "Write It on Your Heart is a minicourse on how to journal, with an overview of 15 different journaling methods. The author provides basic inspiration, dispels myth-based mental reservations that may be holding you back, and offers lots of Bible study pointers on how to make your spiritual walk more practical and rewarding." 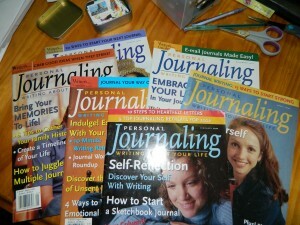 A great magazine for the personal journal writer was Personal Journaling: Writing About Life but F&W Publications, publisher of Writer's Digest, quit publishing the magazine in 2003. Trust me, I was really sad when this magazine disappeared! I enjoyed the writing prompts and the journaling ideas. I searched and searched for another journaling magazine but haven't found anything even remotely close. What is your favorite journal to write in? It was a great magazine! I wish they still published it! Write It on Your Heart sounds like a great resource! Thanks for the idea. I have several journals on the go, but don't write in them religiously...only when I'm inspired. I also use Penzu.com an online journal. Thanks for visiting my blog!